Un film d'épouvante à l'ancienne qui réserve des moments de grande tension. Patrick Wilson, Rose Byrne, Barabara Heyshey et Lin Shaye participent à la réussite du film en incarnant pourtant les pires clichés pour un film d'horreur, mais avec toutes les nuances, et les émotions nécessaires. Pretty much the definition of mediocre. 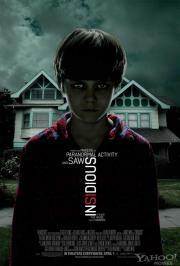 That's not to say that there isn't anything redeeming about Insidious. It has some amount of good atmosphere through a large portion of the run time. However, the buildup is lost as the story falls flat on its face in the final act. Horror fans might find something to like here but not many others. Extremely effective haunted house film delivers the goods in spades for the most part; follows the template set by THE EXORCIST by presenting the supernatural hauntings in the context of everyday mundanity, aided by likable and believable performances from Byrne and Wilson, and the late shot of energy provided by Shaye as resident ghostbuster. Loses some steam in the final act as the abstract scares become more literal, and hampered by an unnecessary final scene, but still a fun and spooky ride. The same as every other mainstream horror film from the past couple of decades. Follows the formula laid down by the Ring to a T. More interested in physically startling you than unsettling with ideas. Mediocre.